The trails were finally turning green! Spring is in the air! 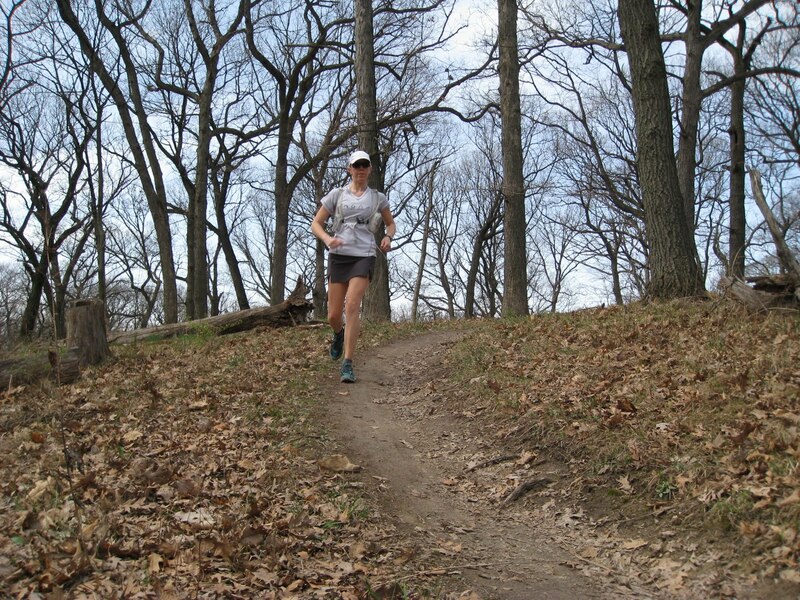 We headed out to Palos Hills on Sunday so that Geof could get in his long run and I could hike while he did so. It was an almost picture perfect day for it, too. We decided to park at the Little Red School House and play on some different trails for a change (this is part of the northern section of the Preserve). I was going to stick to the yellow loop (the map doesn't show the full loop for some reason, but rather only 5.2 miles of it...it's actually 8.3 miles all the way around), with a quick jaunt on the 1.4 mile black loop for some singletrack. The sun was out in force at first, then it played hide-n-seek for the rest of the time, finally succumbing to the thickening rain clouds right as we finished our respective runs. Perfect timing! I was really excited to get onto some singletrack again. 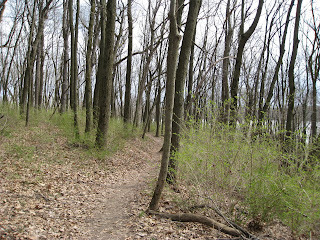 I started out fast hiking, enjoying the breeze and sun on my legs and arms. My Atayne shirt was very happy to see the light of day again and not be hidden under three layers of winter running clothes. 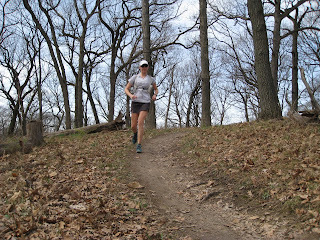 I was also testing out the newest addition to my running wardrobe, the REI OXT Fleet Skort. My dividend was very happy to be spent on this running skirt...four thumbs up (Geof liked how it looked on me :))! I think I'd like another one! After about an hour, I decided I was warmed up enough and the back of my knee was responding well, so I picked up the pace a bit and pulled off what felt like a run. Whoa, mama, that felt good! 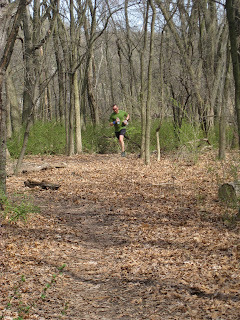 As long as I maintained a shorter stride, midfoot strike under my hips, and lifted the knees just a tad (very similar to a POSE style of running from what I understand) all felt amazing. 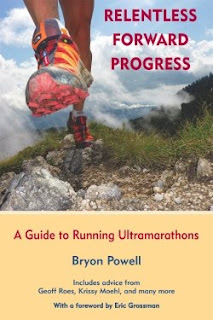 As soon as I lengthened my stride to match my old ways, adding in a heel strike, my knee got cranky. Hmmm, guess I'll stick to my new stride as long as it continues to work so well. Of course, I was mixing in near-equal parts walking and running...can't get ahead of myself just yet. I could tell that all my hip and core strengthening was finally coming into play; it certainly makes a difference! Geof was running around on other trails as well to make sure he could get in all his miles, and he turned around to meet up with me on the yellow loop. We hiked for a short bit, then I decided it was time to run. It was so great to finally run together again...it's been a few weeks and long overdue. After he showed me where the yellow loop zig zags kinda funky, he went to do another shorter loop up a ways and said he'd meet up with me on the black trail. I decided to hike the 1.4 mile black loop and take in the views. After a bit, I came upon a little mini-ravine, if you could call it that. I stopped to listen as I thought I had heard a loud cracking sound, and just then I hear Geof shout and I look to my right...a gigantic mutha of a tree fell over across from us, not 30 feet away! Holy moly, how often do you see that kind of thing?! It was one of those super tall and fat trees, not some wispy little sappling. And it was down for the count. So cool! We both stood there in awe for a minute. 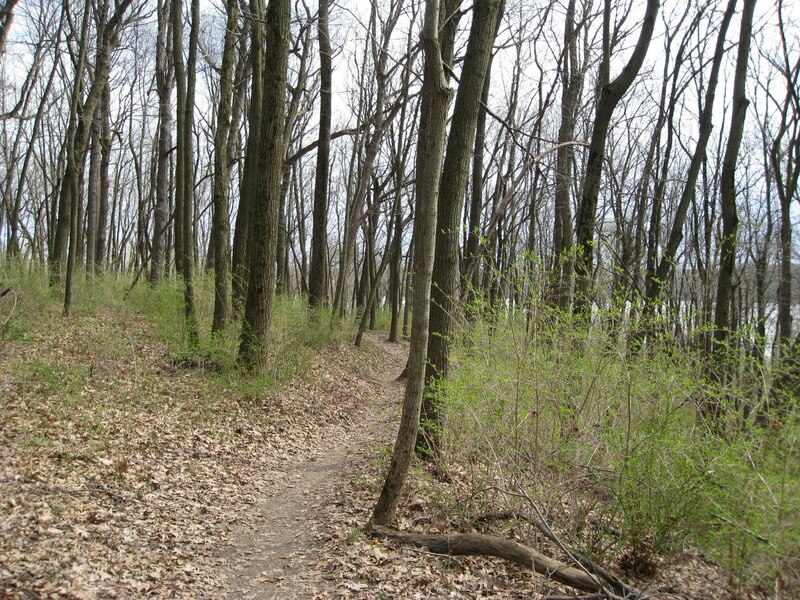 After that, Geof continued on for another loop of the black trail and I headed back towards the parking lot, finishing up just about 10 miles for me. Bam! 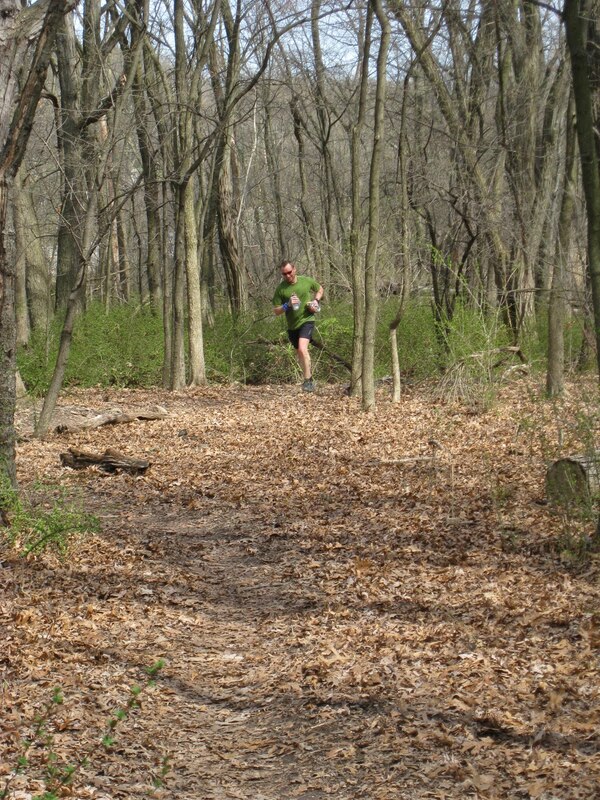 I had a similar tree experience at the Pisgah 50K a couple of years ago in NH. I was running all alone and a big tree fell very close to me. It was an awesome and humbling experience.